HATE him or love him, but the truth is this guy just has a taste for life, fashion, exotic fragrances, shoes, food, houses and a weakness for expensive, flashy and posh cars. While all economies of the world reel under the worst recession in the history of mankind, property magnate Phillip Chiyangwa is living in a world of his own which seems unfazed by the developments in the global economic arena. 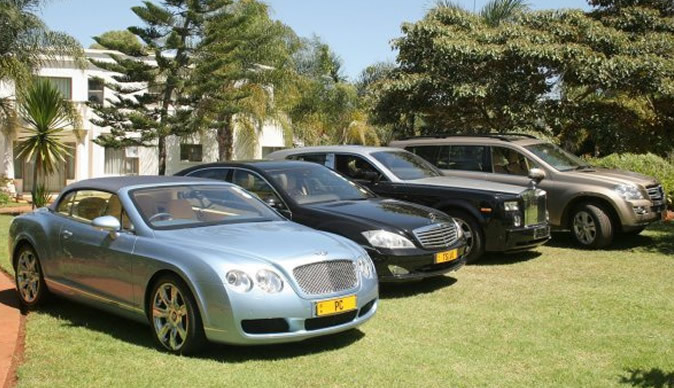 Last year the flamboyant businessman bought himself a black Dodge Nitro with personalised registration "Ndigere" and a Bentley Continental with "PC" (abbreviation for Phillip Chiyangwa) as its registration. Anyway, he no longer drives the Dodge Nitro. Why? He says: "I liked it at first and I thought it was a unique car. All of a sudden a lot of people are now driving it. I have since given it to my son. The driver's seat of that thing is not very comfortable for my back. "Ndiri mwana waMwari, mwana waZvimba Machiorera, Ngonya chaiyo," and like his famous gospel, "No weapon formed against me shall prosper, for He is in me and I am in Him." Last month he bought himself the latest Toyota LandCruiser ' black in colour ' and a gold Mercedes-Benz GL 500, both V8 machines. Last week he unleashed a black Rolls Royce Phantom (extended wheelbase) ' the most distinguished of British automakers. Phillip Chiyangwa's Rolls Royce Phantom is the first one in the country. He seems to have more cars in his garage than undergarments in most people's wardrobes. This car is royalty and does not come cheap. Who would honestly splash US$500 000 or R5 million on a car, this figure is minus the duties to the fiscus, adding up to US$1 million? By the way, this is the guy who owns one of the largest houses in Zimbabwe with 18 en suite bedrooms and 25 lounges? Phillip Chiyangwa's Phantom is a 6,75-litre V12 machine. Just the size of its engine speaks volumes. With 48 valves churning 453 horsepower at 5 350 rpm. The Phantom's brutally powerful powerplant is mated to a 6-speed automatic transmission gearbox. Chiyangwa also owns a very expensive Bentley Continental (convertible), Hummer H2, a Chrysler Crossfire, the latest Mercedes-Benz S600 V12 sedan, two latest Mercedes- Benz S350 models (the difference is in their colours), a Mercedes-Benz SL55 AMG two seater, among a fleet of other expensive cars. Most cars come with options, which come at an additional cost, but for Phillip Chiyangwa that is never an issue. All his cars come full house. He has proved beyond reasonable doubt to be a trendsetter when it comes to the automotive world in Zimbabwe, if not in the region. His Phantom comes with GPS navigation aid with full map and voice activation, a Harman-Kardon AM/FM Radio with 420-watts, speed-sensitive volume with Lexicon sound system and 15 speakers in total and a satellite radio that can catch any news channel in the world. By the way, Harman-Kardon automobile sound systems are ranked among the top five best car audio systems in the world. This car has massive wheels and tyres, which are to date the biggest in the production sedan car business, with an effective 21-inch diameter. More importantly, the tyres employ Michelin PAX run-flat tyres, which means that you do not need a spare wheel and you can continue with your journey in case of a puncture. I guess the size of those tyres is a must given its weight of three tonnes. Sitting in the back seat of one of the most quintessentially British automotive hallmarks and being chauffeured by Chiyangwa himself, I could not help feel like the Duke of Edinburgh although I am a prince from the City of Kings, kwaBulawayo. At the rear seat arm rest, at the touch of a button there is a mini fridge, a compartment of two wine glasses engraved RR (Rolls Royce), another compartment with two water glasses, another compartment with two whiskey glasses and finally another compartment with two glass jugs ' all branded RR. Behind the two front seats are high-resolution colour television screens. At the touch of a button curtains automatically move to cover the back seat occupants at all angles. The interior is royalty, guess being a British car although now owned by Germany's BMW it has done well to remain very English. The interior is all wood and hand-stitched hides. Stepping on the lambs' wool rugs without my shoes and socks, it was the softest and most comfortable thing I have ever set my feet on. To sum up the rear, the configuration eschews the individual and personalised seat solution advocated by many latest luxury limousines - it's a full-house luxury lounge on wheels. The Phantom also comes with a trip computer, tyre pressure monitor, and steering wheel-mounted controls for audio, telephone and transmission, voice-activated controls and memory adjustments, among a host of other electronic gizmos. The Phantom has not been christened yet. I suggested that he personalise it "Bvumai" because, hey, we just have to admit that he has style, the dollars, the taste and choice. His Mercedes-Benz S600, Hummer H2, Bentley and Dodge Nitro have been christened Tsivo, Chisora, PC and Ndigere respectively. After the Rolls Royce Phantom - which is the epitome of automobile engineering in the world and a hallmark of excellence since 1912, who knows what car he is buying next? Probably, the 16-cylinder Bugatti Veyron? Time will tell.